I wish Rabuka tries to put me in jail because of what I did in 2006. This was highlighted by the Prime Minister and FijiFirst Leader Voreqe Bainimarama in their campaign meeting in Drauniivi. While speaking in the iTaukei language, Bainimarama says that unfortunately some people agreed to what Rabuka said that if they win, they will put the Prime Minister in jail. He says that Rabuka allowed immunity in the law to protect coup makers. He says that this part of the law was brought forward from the 1997 constitution to the 2013 constitution. Bainimarama says that if Rabuka tries to put him in jail, then they will have to go against the 2013 constitution. The FijiFirst Leader says that Rabuka was lucky to not have been taken to task for coming to ask to take over the military in 2000. He says that Rabuka visited the late former President, Ratu Sir Kamisese Mara at Government House in 2000 after the parliament takeover by George Speight and the rebels, and asked if he could take over the military, but Ratu Mara did not agree with that plan. Bainimarama says that he was in Norway at that time. The late Ratu Mara had also said in an interview in 2001 that Rabuka had said that he was ready to take over as Army Commander to deal with the situation as Bainimarama was away. Bainimarama says that Rabuka has also admitted that he was in Queen Elizabeth Barracks on the 2nd of November, 2000 but Rabuka said that he was sent to better the situation, adding that no one sent Rabuka there and he had his military uniform with him in his car at that point in time. He says that Rabuka then went to the camp to ask the senior officers in camp if he could take over but also refused. The Prime Minister says that Rabuka was also lucky on that particular day to not have been shot and was hiding under a table. 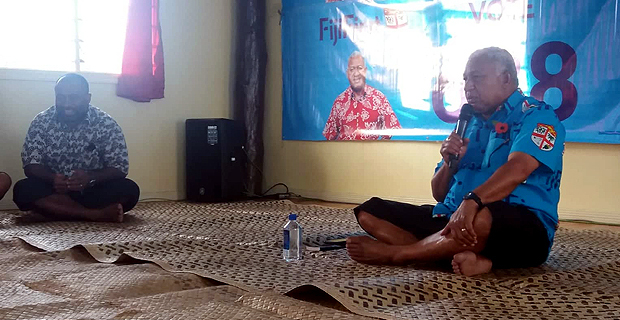 Bainimarama says that Rabuka has highlighted that in the first 100 days of a SODELPA government, they will establish a Truth and Reconciliation Commission to heal the division and scars left by the events of 2000 and 2006. He says that Rabuka has forgotten what he had done in 1987. Bainimarama says that tomorrow he will come face to face with Sitiveni Rabuka on Straight Talk with our News Director Vijay Narayan, and he will ask Rabuka on these issues. He says that he will question Rabuka on why there is no mention of what happened in 1987 in the establishment of the Truth and Reconciliation Commission.